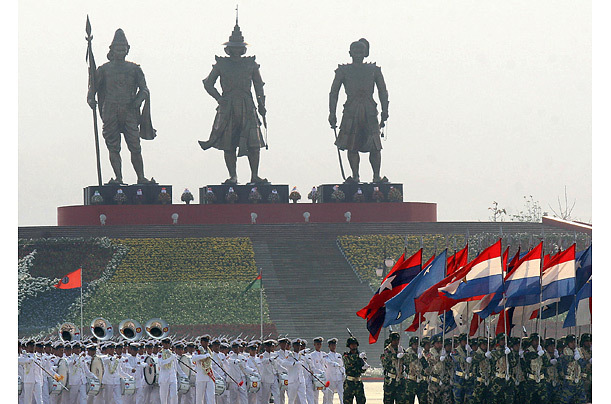 Did you know that the moment of Burmese independence was chosen by an astrologer? That’s why everyone had to get up before dawn to inaugurate the brand new state at 4.20am on 4 January 1948. Burmese astrology, like its cousin Hindu astrology, is surprisingly similar to ours, but with a dash of Chinese number theory – and a slight shift in the signs of the Zodiac. Importantly, the seven traditional planets plus the North Node are used and a horoscope is cast in the same way that we do, so its possible to surmise what was going through the astrologer’s head when he chose the day and the hour of independence. occasions to weddings, under the guidance of asrologers. to the middle of the jungle because of the planets. So, um, what went wrong? Burma has been a political, social and economic basketcase for years, suffering under one of the nastiest regimes on the planet. 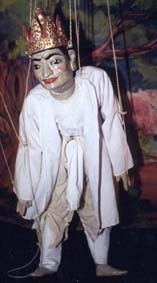 Since independence the country has gone from being the second richest country in the region (after Japan) to pauperdom. The astrologer who cast the electional chart for independence clearly wanted to make sure the government of the fledgling country was strong and stable. She, or he, succeeded – just a little too well. Mars and Saturn are at the top of the chart, and Jupiter is rising in its home sign Sagittarius – powerful, traditional aspects of kingship. (In royal charts, even that of our own dear queen, you will often see Jupiter or Saturn or even both on these angles.) These three planets are in the ninth house of pomp and circumstance (among other things), the natural house of showy Sagittarius. But what is the job of government? To protect and nurture the people? Or to keep them under control and the ”king” in power? What is the job of the astrologer? To work for the people or for the paymaster? Mars on the Midheaven in a country’s chart suggest the army is going to be running things. Fine if you’re a 17th century ruler of a small nation with some powerful and aggressive neighbours on your borders. Not so great if you want to create a listening democracy. Stabilizing Saturn is in detriment in Leo where it is inclined to be – you guessed it – despotic and controlling. Now those Burmese astrologers did not use our modern planets. Maybe they would have made some different choices if they had, because Saturn in Sagittarius is conjunct power-hungry Pluto which in turn trines the planet of ”I want more and I want it now” Jupiter in Sagittarius which lies exactly on the Ascendant. Sagittarius, as we know is a wonderful sign, full of enthusiasm and vision – but give Sagittarius too much power and things can go a little crazy. The 9th house, from where Mars, Saturn and Pluto dominate this chart, is Sag’s natural house, so altogether the sign of the centaur is strong in this chart. Sometimes Pluto shows us a place in the chart that can never be satisfied like a hole that can never be filled. The country’s leadership is like a hungry maw, guzzling and guzzling, will it ever have enough? Than Shwe, the head of the junta, is plundering his country. His daughters wedding was rumoured to have cost $300,000 at a time when people in Burma were starving. A video of the wedding shows her decked in diamonds worth that much alone. The Sun is in the second house of wealth. Despite the poverty of its people, Burma is, in fact, very rich in natural resources. Pluto is at an uncomfortable angle (a quincunx) to the Sun suggesting a crooked path between the two planets. It’s just that all that money goes straight into the Plutonian (eg bottomless) pockets of the junta. It’s interesting to see that Mercury is cazimi the Sun in this chart. In other words it is so close to the heart of the Sun, that it is super-solar-powered. My impression of the Burmese government is that, in fact, one of its greatest weapons is silence – both by keeping silent itself and by stifling the voice of its people. Interestingly, silence is specially important in the Burmese Buddhist tradition. But what was that astrologer thinking about the people of Burma? For that we have to look to the Moon. She is in Libra, the sign of peace and good manners. You would think the people would be docile and gentle with this placement – and to an extent they are. But Libra is also the sign of debate. They may not fight the government but the people are willing to argue for peace; it seems indefinitely. The Burmese people have been in conflict with their government – more or less – since the 1960s but for the most part it’s been non-violent. But that Moon also trines Venus (which rules Libra) in freedom-loving Aquarius. Is that the one chink in the otherwise perfect dictatorship chart? And Lady Venus, supported by this trine, is exactly opposed to the planet of brute power, Pluto in the sign of kings, Leo. Another outer planet, the Burmese astrologers will have ignored is Neptune conjunct the Moon. I wrote about this in my last post. 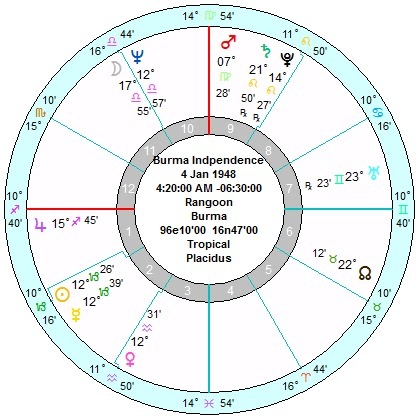 It shows the people of Burma are able to dream of an ideal, which exactly trines the Venus and is in hard aspect to the country’s Sun and Mercury. This last suggests that the dreams of the people are in conflict with the reality of the situation, but there is dynamism there. If that conflict could be resolved, change can come. There is a Grand Trine between peaceful Venus, the Moon and revolutionary Uranus in the air signs, suggesting that change will come through negotiation and talk not force. I do not have a time of birth so it’s cast for midday. Venus may indeed turn out to be the nemesis of the dictatorship, precisely in the person of Aung San Suu Kyi, who is surely Venusian in her grace and beauty. Venus is also semi-sextile the Sun-Mercury knot. In fact, she aspects the midpoint of these two planets, interposing herself between them. 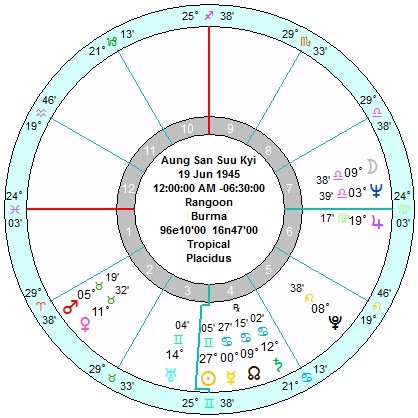 Aung San Suu Kyi’s own Venus is conjunct Mars in Taurus, where it is strong in its own sign. She has the strength to wait for peace. 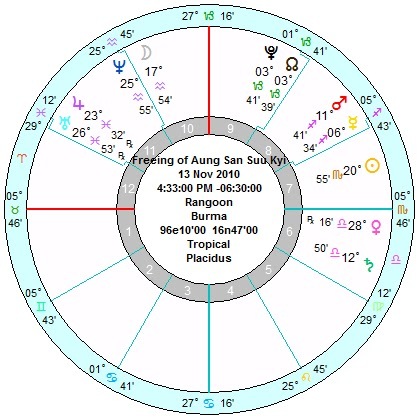 The astrologers employed by the junta in Burma must be advising them about Aung San Suu Kyi – when to release her and how to deal with her. So what were they thinking? Why do it? See my last post for more details. For one thing, there was a very “inauspicious” eclipse over Burma in January. The removal of the capital city to the jungle a few years ago does suggest they are nervous. But most of the change I see coming is signalled by the outer planets. Western astrologers believe, and I am among them, that the transit of Pluto through Capricorn has already had some pretty earth-shaking consequences, including the collapse of the banking system in 2008 and all that followed. In the coming years many, many countries are going to feel the full power of Pluto conjuncting their Suns. This is because so many countries, including Burma, were declared independent or created new constitutions at the beginning of January, which is around 10°-15° Capricorn. Pluto is the planet of transformation but also of annihilation. If the junta does not get ready for change in 2013/14 now, they may find themselves swept aside. Especially since Uranus, the planet of revolution will be activating the Air Grand Trine from it’s position in Aries for the next seven years starting in 2011. Jupiter will kick start that process with a tour of fighting Aries from where it will send power to that Grand Trine. Let’s hope that, although Aries is a martial sign, the revolution is peaceful.